No college tuition for community college students would be a weight lifted for many people. The proposal is that the federal government will cover 75 percent of the cost, and the state would have to pick up the remaining 25 percent of the cost. On the plus side, there will be more student services for community college and better alignment of high school and college curriculums which will reduce the number of students in remedial courses. According to PBS NewsHour, Obama also wants to help students get out of student loan debt by creating a system of offering debt relief to those who have the most burdensome debts. Congress has slowly made the changes that Obama called for in 2010. They still have not acted on the proposal since. “My plan would make the American Opportunity Tax Credit a permanent part of the tax code, increase the amount that could be refunded to taxpayers and make the credit available to students going to school at least half-time and cover five instead of four years of schooling” Obama added. 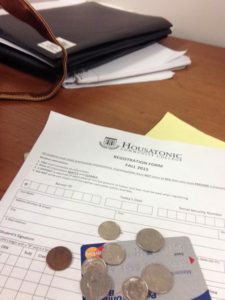 Jomo Marsh, a college student at Housatonic, wants free tuition to come in action quickly, “I would definitely love to see tution be free because of the financial burdens that would be lifted of my shoulder,” he said. Profesor Edwena Chance, an English professor at HCC, believes that while free tuition is great it would not pass Congress. Andrew Kelly, director of the Center on Higher Education Reform at the American Enterprise Institute, has argued that making a community college free not only will help students but will also boost the economic growth and help close the country’s growing wealth gap. In Tennessee, a state with Republican leadership, and Chicago, a city with Democratic leadership, are showing that free community college is really possible. There are many negative factors that may come from free tuition middle and upper income students will have hefty subsidies. Only 20 percent who enroll in a two-year public community college program actually graduate within 3 years, and typically only 60 percent of enrolled students actually do return the following year. The article This Country Just Abolished College Tuition Fees by Joaquim Moreira Salles, published on Think Progress, states that the government spends $69 billion subsidizing college education and another $107.4 billion on student loans in the United States. Restructuring the budget for education will also force public universities to be brought down to zero and put pressure on private schools to bring down their education to zero in order to be more competitive. Having free tuition for all americans is a very controversial topic. Obama’s ambitious plan may be extremely helpful but many politicians believe that it is impossible to commit to. Obama’s plan seems to be working in other states, maybe Connecticut will be able achieve this plan for free community college tuition here. Do you think community college will eventually be free? Should it be? Let us know in the comments below.